GLASGOW METS can be forgiven a sense of deja vu – or perhaps “deja NU” – when they look through the net in Sunday’s men’s Scottish Volleyball Cup Final at Edinburgh University Pleasance. The opposition is different than when they lost in five sets to Edinburgh Jets in last year’s final in Wishaw – but the players are only too familiar. Five of the team that played for Jets in that final are now lining up for NUVOC, who are bidding to become the first Second Division team in history to hoist the trophy (4.15pm start). Player-coach Martyn Johnstone, who guided Jets to their first league and cup double, took what he admitted was his most difficult decision in the game when he moved down the league ranks to join NUVOC. Great Britain cap Paul Glissov also moved across the capital along with Marcin Krakowski, Piotr Szpynda and Abdoulle Bah. It is no surprise they romped to the second-tier title, losing only one match in the process and that being when the league had been wrapped up. Promotion was clinched last weekend when NUVOC came through the play-off against Bon Accord in four sets. It was a double celebration for setter Johnstone, who also coached NUVOC women’s team to their Division Two title and a promotion play-off win over North Lanarkshire. If it was a gamble to leave Jets, it is one that has paid off spectacularly and the bonus would be a cup final win over Jets in what is NUVOC’s 40th anniversary year. “I left Jets as the club was changing and it wasn’t allowing for flexibility which I and most of the guys needed at this stage of our lives so we decided to move on,” Johnstone explained. 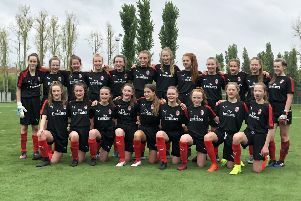 “I have really enjoyed our matches against Division One competition this year in which the new NUVOC players have really stepped up to face the competition and not relied on the guys who have already been there and done it. “There are a lot of good players coming through the NUVOC youth system through the work of Bill Stobie and his Junior coaching team. “We have started to integrate these youngsters with the first/second teams in the National League to give them a higher level of competition to improve their development faster. “No words can express how much Bill and Gerry MacDonald [NUVOC men’s first-team coach] have contributed to the success this year with their consistent hard work to make the club better and forward thinking. Johnstone believes that Mets are favourites going into the final, having won the Final Fours last weekend to add to the John Syer Trophy earlier in the season and finished runners-up in the Scottish League. The two teams are well aware of their respective strengths but Mets’ captain Alan Krawczyk has stated that they have something up their sleeves to deny NUVOC the dream conclusion to their season. “On paper, Mets are favourites, but Mets were favourites last year too,” continued Johnstone. “After watching Glasgow Mets this year, I think they have expanded their hitting options with the return of Alan Krawczyk to the starting setter slot. “He is linking extremely well to Ryan MacLeod at opposite but also creates a lot of space for all the spikers. Whatever happens, at least one Edinburgh team will win the Scottish Cup this weekend. The women’s final on Sunday (1.45pm) is between City of Edinburgh and Edinburgh Jets.